Take a narrated adventure inside the Cell! What are the origins of cells? How did they come into existence? Cells are the basic units of life. Cells come only from other cells. Common features: All cells (prokaryotes & Eukaryotes) have several basic features in common. Prokaryotes - cells with no nucleus or organelles with membranes. 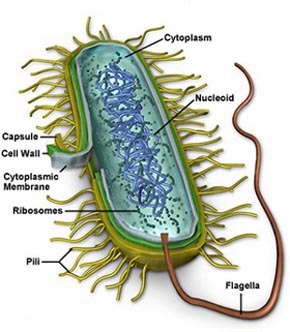 Bacteria and blue-green bacteria are prokaryotic cells. Eukaryotes - cells that contain a nucleus and organelles surrounded by a membrane. The cells of protozoa, algae, fungi, plants, and animals are eukaryotic cells. * Plant cells and animal cells are similar, but do not have exactly the same cell parts and shape. Cell organelles: components of cells with specific functions. A complex barrier of lipid molecules separating the cell from its external environment. These molecules can move apart to allow larger particles to move in or out of the cell. The "selectively permeable" cell membrane regulates what passes in and out of the cell. Nutrients and minerals spread through the cytoplasm to all parts of the cell. The constant motion of this gel-like substance is called cytoplasmic streaming. 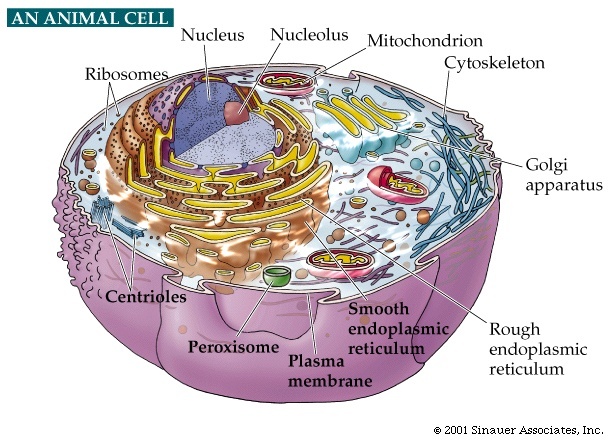 The structure inside the cell that directs cell activities. Contains the DNA of a cell. On the outside of some cells, bacteria and plants, this structure functions for support and protection. 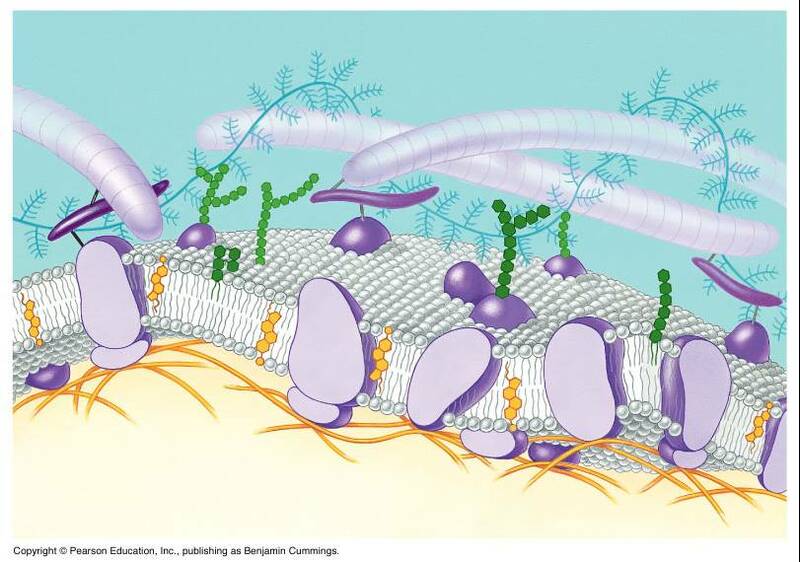 There are pores in the cell wall allowing substances to come in contact with the cell membrane. Primary cell wall - formed during cell growth, it is composed of parallel layers of cellulose and pectin. This structure allows the cell to expand as it grows. While it does provide support, it is not nearly as strong as the secondary cell wall. Secondary cell wall - formed after cell growth stops, it is composed of interwoven cellulose and lignin fibers. This structure is very strong, but does not give. It gives plants their "woody" characteristic. The sites of protein synthesis in a cell. These small, spherical structures are the most numerous organelles in almost all cells. Some ribosome's produce protein to be used within the cell and some produce protein that is "exported" to other parts of an organism. A membrane system of folded sacs and tunnels in the cytoplasm. Rough "ER" is covered with ribosome's. It is common in cells that export proteins and directs the proteins flow. Smooth "ER" as few or no ribosome's. It functions as a pathway for molecules to follow. A stack of membranes or sacs that acts to prepare substances for export from the cell. Once the Golgi apparatus has enclosed the final product in a vesicle, or pouch, the product is sent through the cell membrane. Large organelles scattered through most cells, they are most numerous in cells that use a lot of energy like liver and muscle cells. Respiration centers of a cell. Digestive centers of a cell. They contain many different types of enzymes and digest things from food particles (macromolecules) to a cell's own worn out parts. Most common in plant cells, they are storage sites within a cell. Performs photosynthesis - converting light energy into chemical energy. 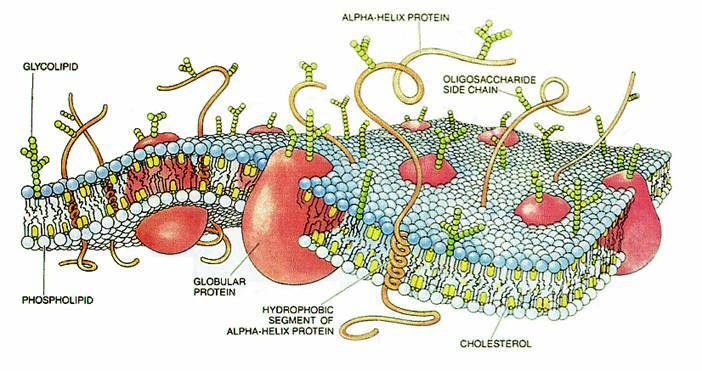 Internal meshwork of protein fibers the provide structural support and involved in various types of cell movement. 1. Who developed the cell theory and in what year? What is the bases for this theory? 3. What are the differences between a prokaryotic cell and eukaryotic cell. Include a diagram of each to support your answer. 4. Compare and contrast animal and plant cells, structurally how are they different? 5. Right click on this The living cell and "save target as" to your desk top. Once it has finished downloading view the video and complete the video quiz. Write the video quiz questions and answers with today’s assignment. You have just been hired as an organelle sales person at Cell-to-Cells Sales Ind. You will be tasked with selling a particular cell organelle. How well do you know the function of cell organelles? Well you are going to need to know your organelles and cells because you are about to become a dealer in the competitive market of cell organelle sales. Click on this link to get more information on this task. As a side job to make extra cash you will also be working for Survivor Cells Corporation as a cell organelle buyer and construction manager. You will be be asked to develop a construction proposal to build a specific type of cell for the clients of Survivor Cells Corporation. Your CEO Steve Stemcell has more information on this task a this link . 2. This is a nice site to practice building a cell online. Some substances, like water, move freely through the cell membrane by a process known as osmosis. In osmosis, particles move easily from an area of high concentration to an area of low concentration by molecular motion only. Cells can push particles in the opposite direction, from low concentration to high, but it will take energy from the cell to do this. Passive Transport-Passive transport does not require energy. Diffusion allows particles to travel from an area of greater concentration to an area of lesser concentration until equilibrium is reached. Osmosis is the diffusion of water through a selectively permeable membrane from an area of high concentration of water to an area of low concentration of water until equilibrium is reached. Coupled channels bring sodium and sugar molecules into the cell. Proton pumps use hydrogen ions to produce ATP molecules. Some cellular organisms ingest food by endocytosis and release waste from a vacuole by exocytosis. Phagocytosis is when one cell engulfs another cell. Pinocytosis is when a cell engulfs liquids or dissolved substances. Explain what is happening in the the animation in the box? You may need to hit refresh on your browser to reactivate the animation. Describe the different "Types of Solutions" as explained at this sight. Visit the following site and complete 1-6 below (word version ). 1. Read through Membrane Structure concept 1 and the review. 2. Read through Osmosis concept 2 and the review. Complete practice 2- identify the concept being practiced and then write an explanation of how the practice item is modeling that concept (what is happening in the activity and why?). 3. Read through Selective Permeability of Membranes concept 3 and the review. Complete practice 3 - identify the concept being practiced and then write an explanation of how the practice item is modeling that concept (what is happening in the activity and why?). 4. Read through Passive and Active Transport concept 4 and the review. Complete practice 4 - list your answers for both the facilitated diffusion practice and active transport practice and then explain why the answers differ between the two. 5. Concept 5 Mechanisms of Active Transport goes above and beyond what is required for this class but you can take a look at it if you would like. What group of cells in the human body does not have a nucleus? The smallest known living thing on Earth is a bacteria in the genus Coxiella. These bacteria are about 8 millionths of an inch (0.2 micrometers) in diameter. Their small size means these bacteria contain only 100 million to 120 million atoms. While this may seem like a large number, keep in mind that the human body has over 5 Billion cells. It is believed that fewer atoms would be unable to build the structures needed to store information and carry out the metabolic processes needed for life. The largest known animal is the blue whale, Balaenoptera musculus. It is known to reach lengths over 100 feet (30+ meters) and weigh 120 tons. The chart below indicates that all animal cells are about 10 micrometers in diameter. This means that the cells of a blue whale and a human are essentially the same size. Honors biology: Read honors section below first. Question: Would a cell survive if it grew to be the size of your head? 1. Draw a table like this one on your paper or print this word doc. of the table and use your data and calculations to complete it. 2. Measure and record the diameter of a large marble, a ping-pong ball, and a baseball, in centimeters. 3. Calculate the surface area and volume of each object. 1. Show how you set up the following calculations on your paper. 2. Use 3.14 for in these calculations. What is the ratio of surface area to volume? How does surface area and volume compare as objects get larger? *After completing the table, use your findings to write an explanation and conclusion for the question. Honors biology: Instead of doing the table above print out this Cell size lab for class. Word doc. or web page version. Read the lab carefully and complete the pre-lab portion before we begin the experiment portion. One idea is Protocells, Can you come up with any others? Red blood cells do not have a nucleus. They are produced in the "flat" bones of the body, live for about 120 days, and die without reproducing. Their sole purpose is to carry oxygen and carbon dioxide in the blood.